With a beautiful full moon tonight, it seemed like the perfect time to share the SOAK Yourself Full Moon Soak Bath Ritual Recipe Kit. I've always loved the moon - since I was a little girl I've been pretty awed and obsessed by space on a whole, and gazing at the moon on a clear night is something I can get lost in. Whether you believe in the power of the full moon or not, I think everyone has a little bit of superstition in them when it comes to a full moon. SOAK Yourself definitely believe in the power of a full moon. 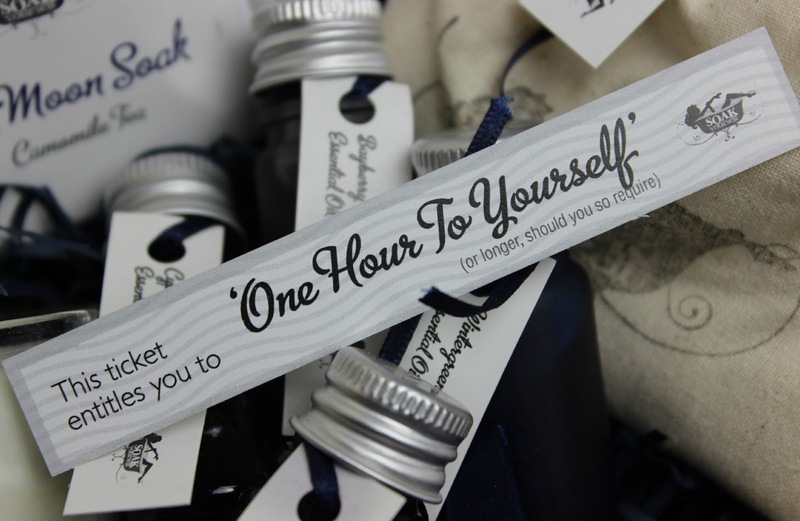 I'm pretty new to SOAK Yourself, a brand created by a busy city professional, Jackie Hope, who wanted to escape the typical 9-5 job, and so SOAK Yourself came to be - encouraging us all to remember how important it is to take time for ourselves. With a lovely selection of SOAK Yourself Bath Ritual Recipe Kits, each has been designed to give us the perfect time out. Filled with products sourced right here in the UK, all ingredients and products included in the kits are both natural and organic, with ranges of organic candles and natural soaps available alongside the Bath Ritual Kits, too. All the Bath Ritual Kits are handmade and hand-packed by a dedicated SOAK Yourself team, with a personal touch on the back of each box where the packer signs your box - mine was packed by the very lovely Jackie herself! There's also a fantastic charity aspect to SOAK Yourself; 50p from the sale of each Bath Ritual Kit goes towards helping charities; from funding computers in youth centres, to buying beautiful plants for hospice gardens, days out for the elderly or helping a sick child make their dreams become a reality. When I was offered the chance to try one of the Bath Ritual Kits for myself, it was hard deciding which one to go for. All of them sound absolutely lovely, with different themes and scents which work in harmony to leave you feeling relaxed and renewed. There's quite a selection to choose from; Blanche the Blues, Broken Heart, Feeling Groovy, Love, Muscle, Remedy, and the box I decided to go for, Full Moon. Inspired by the ancient ritual of bathing and the benefits it can have on our body, mind and soul, each has been designed to encourage a happier state of mind. With high-quality ingredients, essential oils, absolutes, candles and soaps, they make the perfect treat for yourself and a really lovely gift for friends and family who need a little encouragement to take a much needed time out. I decided to go for the Full Moan Soak Bath Ritual Recipe Kit because it perfectly described what I need; a renewal ritual to celebrate the cycles of life and prepare you for the month ahead. Working 7 days a week means my days and weeks go by pretty fast, with little time to indulge in myself and by the end of each month I'm left feeling exhausted, willing away the last few days for the 'fresh start' of a new month. Full Moon sounded perfect for me! 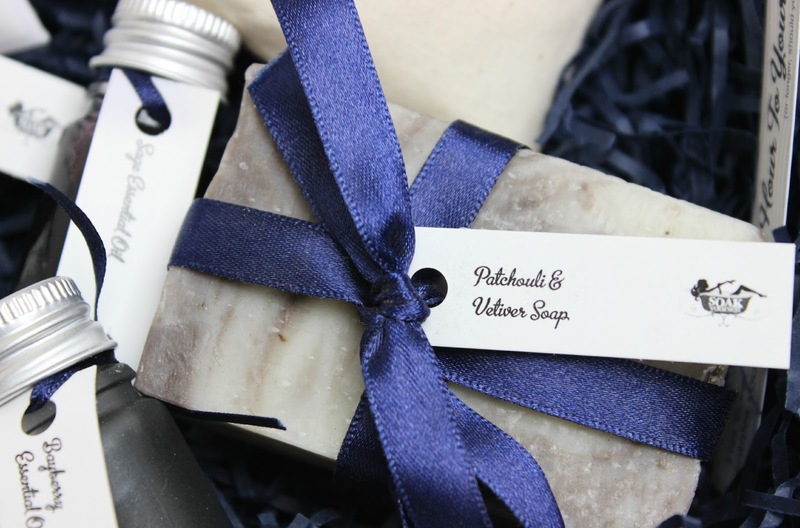 When I opened up my Ritual Recipe Kit I was presented with a beautifully packaged array of products wrapped in SOAK Yourself tissue paper and a delicate navy blue ribbon. The first thing I noticed is probably my favourite added touch to the kit - a ticket entitling me to 'One Hour to Yourself' (or longer, should you so require), which I just think is the loveliest little touch - it brought an instant smile to my face! The kit itself is full of lovely products to help you unwind, with enough for four bath rituals. 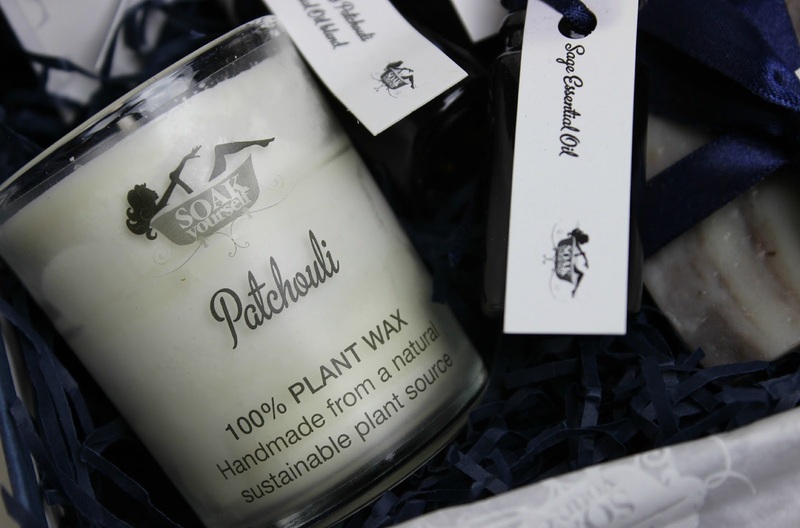 To help set the scene there's a 100% Plant Wax Patchouli Candle, handmade from a natural sustainable plant source which smells beautiful. I love lighting candles when in the bath, but having one specifically tied in to the theme of the box to enhance the experience of the ritual is just super lovely. My fellow tea addicts will love the next bit - four Camomile teabags, to enjoy a delicious cup of tea whilst letting your body be revived and refreshed. There's a bag of Rejuvenating Sea Salt Soak, which contains four individually wrapped bags of Maris Sal Dead Sea Minerals. Four essential oils feature inside the Full Moon kit; Wintergreen, Bayberry, Sage and Cyprus & Patchouli, of which you'll need just three drops from each added to your bath - meaning these will last a long while after you've used up all the other products in the kit. Last but not least, an incredibly beautiful handmade Artisan soap with a scent of Patchouli & Vetiver. The kit includes a little leaflet which gives you some history on SOAK Yourself and the products they create, with a lovely introduction to the Full Moon kit. It's a great way to put you in the right frame of mind for making the most of your ritual, as well as how best to use all the products inside. SOAK Yourself have covered everything, leaving you ready to relax and let the ritual renew your body, mind and soul. 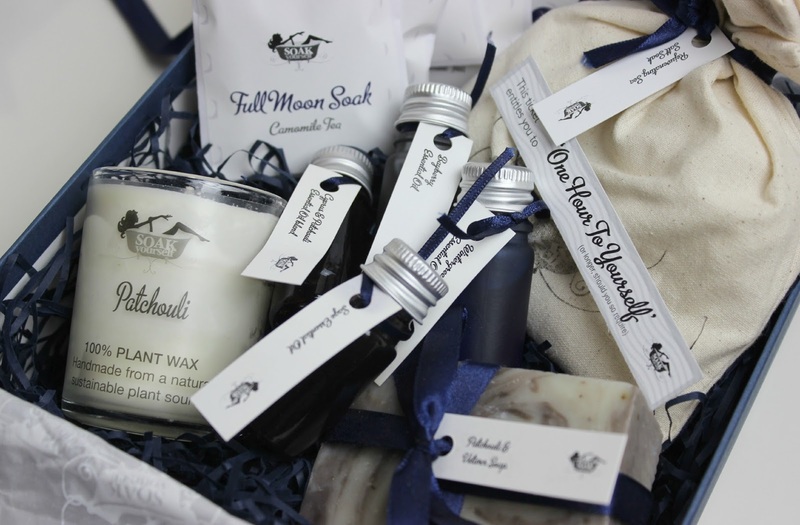 The SOAK Yourself Full Moon Soak Bath Ritual Recipe Kit is by far one of my favourite beauty concepts yet. 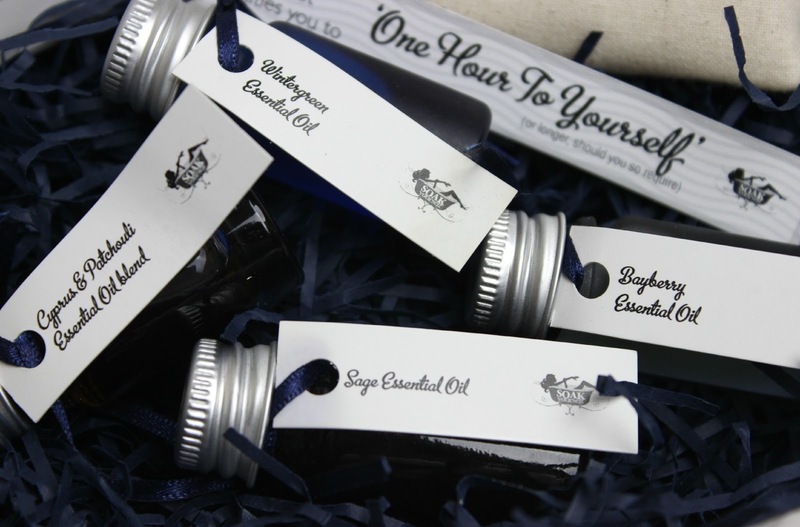 The detail and quality of the box is perfect, and it's easy to see that the box has been created with genuine passion and love not just for the products included, but for every SOAK Yourself customer who experiences their kits. Available in two sizes, there's The Little Box which I'd estimate has one bath use, but the same products and theme, for £25, or the Full Moon Soak Original kit, which has four bath uses (and more out of the oils!) for £60. You can find out more about SOAK Yourself and check out all of their Bath Ritual Recipe Kits here. ooh i've never heard of this brand, sounds lovely! I've never heard of this before! Definitely something I would be interested in!